Today I wanted to give an update on all things Faerie Rose Press, Elderwood Publications, and Moonspinner3 Books. It’s been a while since I have written up one of these type of posts and while I’m in the middle of getting things ready for NaNoWriMo 2018, I thought that I would give updates on what things have been going on for Faerie Rose Press. Let’s start with I’ve updated the look and feel of the site. Let’s start off with the header. 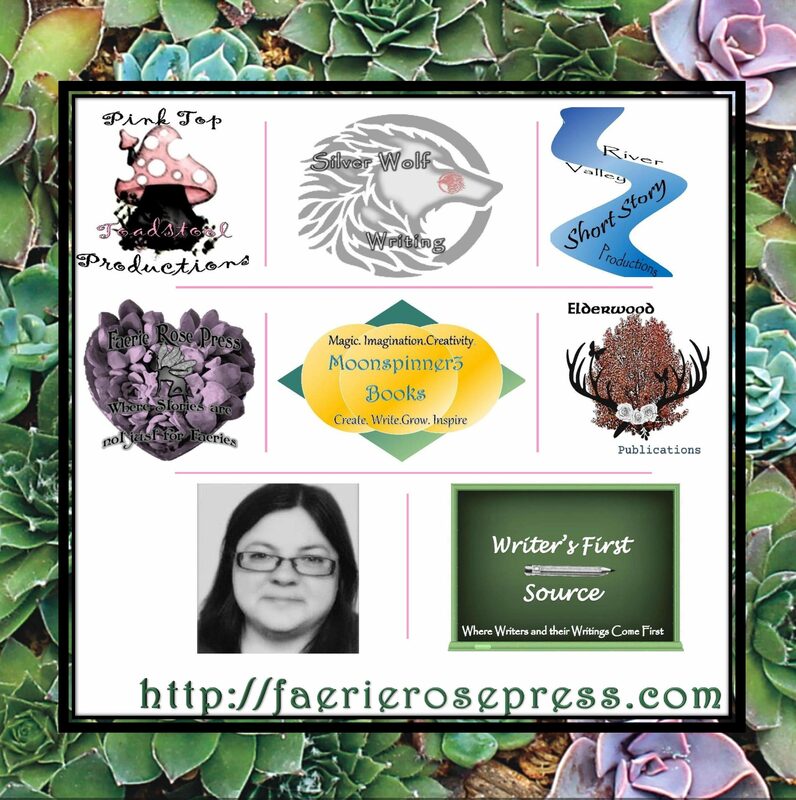 Yes, the header is one that I designed myself, which encompasses Faerie Rose Press and Elderwood Publications on the outside and Moonspinner3 Books (the parent company in the middle) and below that my photo. I designed this header in mind so that it shows the world that I have created from the very beginning and to include over the past year. I have put this same header on the Faerie Rose Press (@FaerieRPress) twitter page, and the Facebook pages for Faerie Rose Press and Moonspinner3 Books, as well as my author page (Tiffany M Dew). Granted, I have not made a page for Elderwood Publications and the reason for that is that I have not gotten around to it and I’m still deciding on that, but for now all updates for the most part are being put on the Facebook pages for Faerie Rose Press, Moonspinner3 Books and my author page. The second and most noticeable change to the website is the look and the color scheme. Yes, it has a black background, with a hint of green. This does not meant that I’m getting away from my purple headings on some of the posts, it was just that I wanted to change up the look of the website. The number one reason why I made the change was due to I wanted something that could show that each day that I take on this adventure, the site is maturing a bit while the content is still the unusual looks at some of the topics. Now one last update on the site that I want to give is that I also updated the Welcome to Faerie Rose post. I thought that since the site has been up for over a year and while I was sprucing things up, I felt that I would update the Welcome address for this page also. This update is a reflection of where this page has been over the course of the year and where it is going into the future. Granted, now that I’m done talking about the site and the changes, lets get on to the most exciting part, the writing. First off let me start my saying that I’m ready to go into what I’m doing for NaNoWriMo this year. I have a title, a draft covered designed and ideas. Oh the ideas are just pouring over me like water in a shower. I’m so happy and excited to take on this new project and to share some of what is going into this project. Although, the title might be considered a working title, so far the title is (drum roll if you please)….The Bird that Sings!!! What I have so far for The Bird that Sings, is that it is set in the future. There is a war that took place and like there are results in every war there are results of this war as well. One of the biggest results is that the females are now known as “birds.” The boys are really non-existent in this word. Any ways, certain birds are deemed far more worthy than others, and one such bird is Sarah. Sarah before the war had originally been given the name, Heather, but she is forced to ignore this name and forced to answer to Sarah. Sarah is worthy in that she is chosen to become the next high priestess. The role of high priestess means you get to rule over everything and every body. Also it means that you can never touch anything or anybody for that matter as well. If someone touches Sarah’s skin, that person even if it’s her handmaiden will be sentenced to death. Also Sarah has taken a forever vow of silence, which can only be broken upon her becoming the next high priestess. So far I have in my notes that Sarah knows what she will become and there is nothing stopping it or at least she thinks. But further Sarah wants to be touched, for she wants to have that connection with someone, even though it is forbidden. This is what I have so far for The Bird that Sings, and I can’t wait to get started writing it. Please, let me know what you think about the cover or the idea that I have for the story. Granted, right now I’m writing down this continuous list of ideas that are coming to me for this story. As for the other stories, yes, unfortunately they have been put on the shelf due to NaNoWriMo and will get done at some point. But I will try to finish one book at a time and hopefully with the energy that I have for The Bird that Sings, it will be finished. First draft and taken through the hole process. I fully know that I have a writing ADHD problem and it needs to be dealt with. But in someways I know that I can’t help it for ideas just come to me, and when ideas come to me, I just want to grab on, but I don’t seem to get them past the first draft. So I need to get there and I’m really, really going to try that with this project. This is something that I must grow upon and mature so that I can put out some books. Now granted I wanted to give one more update and that is in the last couple of weeks, this site has more than 100 followers, and as I said thank you then, I’m going to say thank you again. I mean your support means the world to me and I could not continue on without your support. I thank you a million times over for you finding this site and finding something on here that you enjoy and that you are finding helpful on your writing journey. This thank you, goes out to anyone and everyone that continues to find this site and I hope that you keep coming back for more. I’m not done giving out advice, suggestions or helping others along their writing journey. Whatever your reason for coming, thank you and that means the world to me. Also don’t forget as a gift that I have posted on here is my Prepotober Work Book. This workbook is coming quite handy for my own prepwork for The Bird that Sings. I hope that you are also finding it handy as well. Well that is all for the updates, I hope that you all have a fantastic writing day!